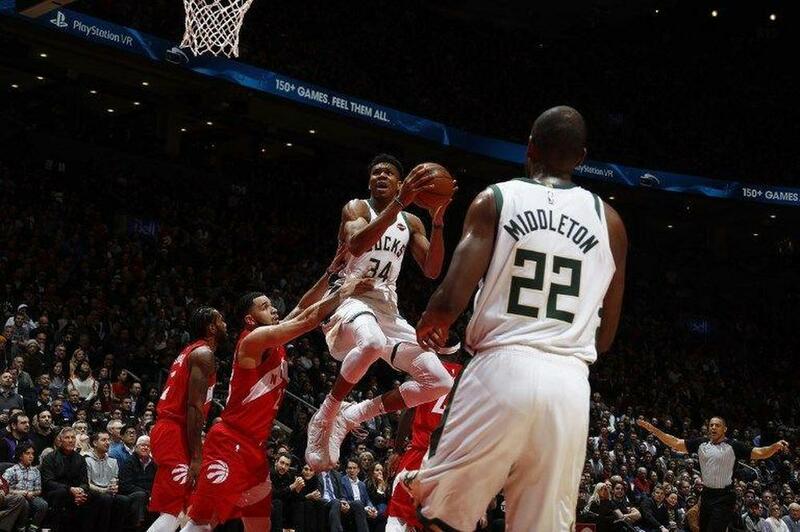 The host Raptors rallied to cut the Bucks lead to six points when Antetokounmpo ran into foul trouble in the fourth quarter on Thursday. But the Bucks were able to pull away for the victory and take the season series with three wins in four meetings. Khris Middleton added 18 points, and D.J. Wilson had 16 points for first place Milwaukee, who won their eighth contest in the last nine. Eric Bledsoe tallied 14 points, Brook Lopez and Malcolm Brogdon had 11 each and George Hill added 10 for the Bucks. "It was a great playoff atmosphere, a very good test for us," Milwaukee centre Lopez said. The victory ensures the Bucks will have the best winning percentage in the East through February 3, meaning Bucks coach Mike Budenholzer will represent the conference at next month's NBA all-star game. Pascal Siakam scored 28 points for the Raptors, who dropped to 1-3 in their last four games. Kawhi Leonard added 16 points and eight rebounds, and Serge Ibaka had 12 points and 10 rebounds. Kyle Lowry, Fred VanVleet and Norman Powell scored 10 points each. The Raptors led 25-22 at the end of the first quarter but the Bucks took a 56-47 lead into the half. Bledsoe nailed a three pointer with just under seven minutes to go in the third to stretch the Milwaukee lead to 22 points. Elsewhere, Derrick White scored a career-high 26 points as the San Antonio Spurs continued their dominance at home over the Brooklyn Nets with a 117-114 win. LaMarcus Aldridge made a clutch three point play in the final minute to help the Spurs rally in the final quarter and record their 16th consecutive win at home over the Nets. Aldridge, who was named a reserve on Thursday to the 2019 all-star game, finished with 20 points and 13 rebounds in the win. DeMar DeRozan chipped in 15 points and 10 rebounds in his return from a three-game absence because of a sore left knee. D'Angelo Russell had 25 points, nine assists for Brooklyn. Joe Harris and DeMarre Carroll had 18 points each for the Nets in the loss.